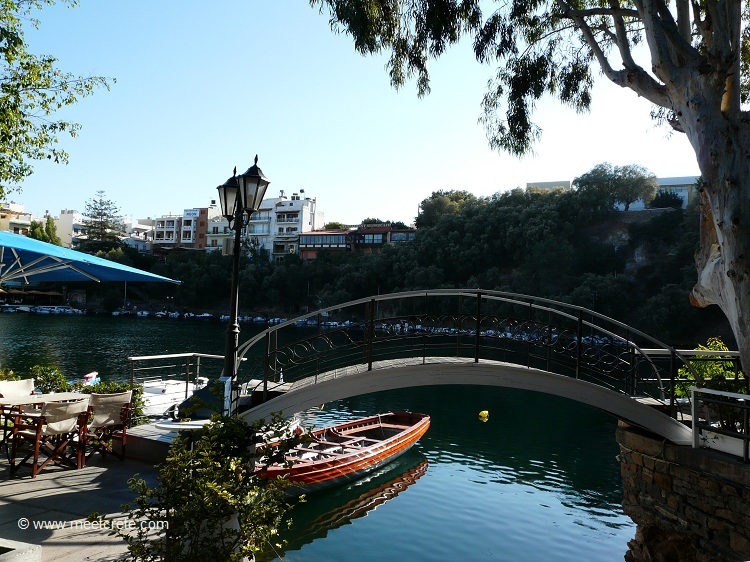 Lake Voulismeni is a former sweet water lake, later connected to the sea, located at the centre of the town of Agios Nikolaos. It has a circular shape of a diameter of 137 m and depth 64 m.
Wherever the eye falls, one is surrounded by the sea. And if even a huge cruise ship lies at the Quai, the sight in relation to the size of the town is almost surrealistic. It is beautiful here; the mile-long promenade leads from one end of town to the other: past the marina, the sandy beach, the harbor and cafeterias, past the lake with another waterfront and finally past hotels to the last houses and the bay Ammoudi. Even a little further it leads to the Byzantine church of Agios Nikolaos from the 8th-9th cent AD., after which the port town was named, on the north-eastern peninsula. 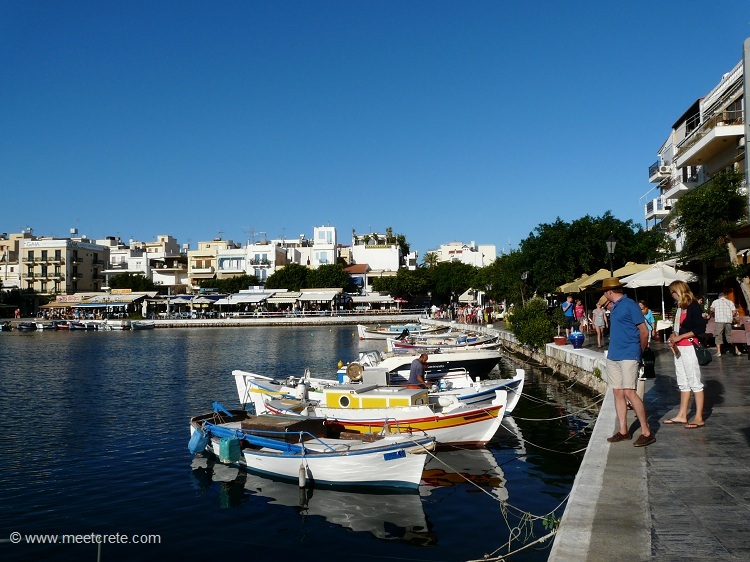 Today Agios Nikolaos has about 11,000 inhabitants. The administrative seat of the Lassithi Prefecture was built on the ruins of the ancient city Lato pros Kamara, which was the harbor city of the ancient site Lato in its time. 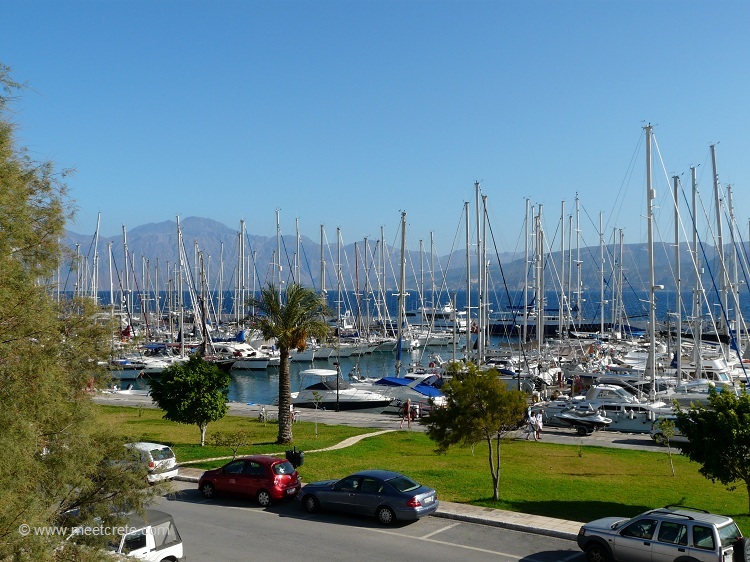 Since 1970, with the tourist development of the Mirabello Bay and the construction so of world-renowned hotels such as the Elounda Beach Hotel, Agios Nikolaos is one of the tourist centers of Greece. International heads of state and VIPs from all categories enjoy the discreet comfort of its luxurious accommodation in the coastal region between Agios Nikolaos and the village of Elounda. 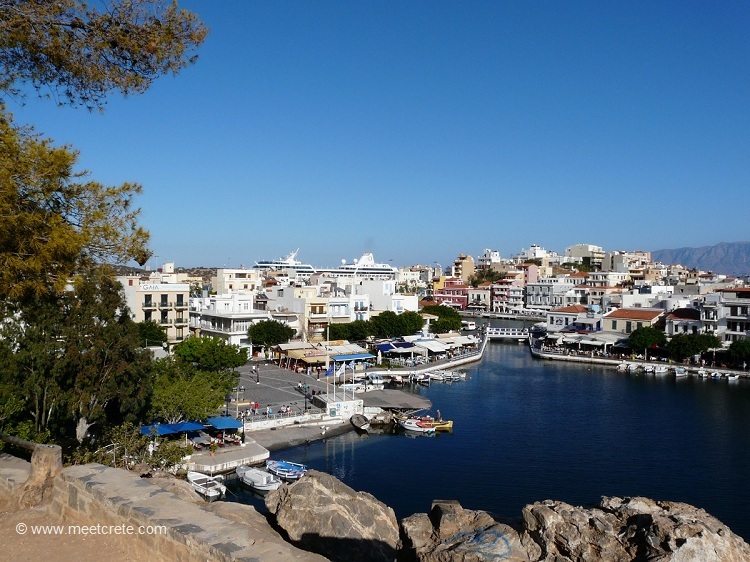 Lake Voulismeni is a former sweet water lake, later connected to the sea, located at the centre of the town of Agios Nikolaos. It has a circular shape of a diameter of 137 m and depth 64 m. The locals refer to it as just “the lake”. The lake connects to the harbour of the town by a channel dug in 1870. A panoramic view of the lake can be seen from a small park situated above it. According to legend, the goddess Athena and Artemis bathed in it. Every year at midnight turning to Orthodox Christian Easter day, the majority of the population of the town gathers around the lake to celebrate with fireworks, and firecrackers thrown by the people attending that highlight event. It was reported that the German army during their withdrawal from the area at WW2, disposed parts of their weaponry and/or vehicles into the deep lake. The town is home to the finest archaeological museum in Crete founded in 1970 and consisting of eight rooms. The collection contains recent finds, mostly from eastern Crete. 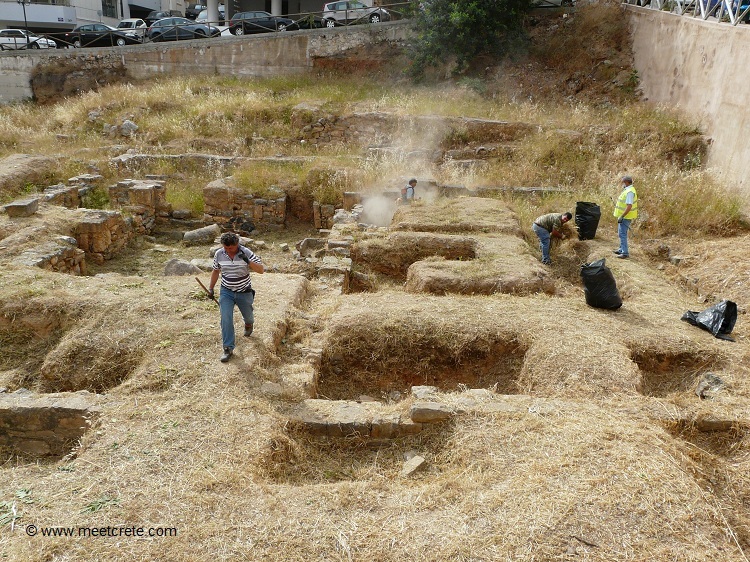 The finds are in chronological order beginning with the Neolithic era, Minoan remains, and ending with Greco-Roman finds. One of the museum’s most famous exhibits is the Goddess of Mirtos. This libation vessel is in the form of a female figure and was discovered at the Bronze Age settlement at Fournos, near Mirtos. The museum also contains important specimens of the Daedalic Period (seventh century B.C.) when, for a brief period of time, Crete led the Greek world in setting the foundations of the great art of sculpture for the next centuries. The head of a clay statue of a woman, considered to be one of the masterpieces of Greek art, is displayed in the museum. The museum is closed for restoration since 2011. 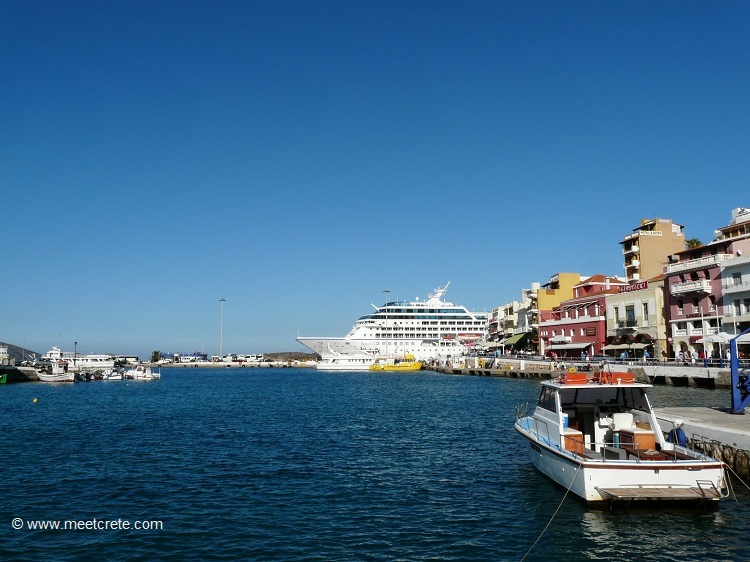 In the middle of Agios Nikolaos lies the excavation site Lato pros Kamara, the remains of the ancient harbor town of Lato. It is quite a small church that was built between the 7th and 9th century, during the Iconoclastic period, as indicated by its schematic decoration. Geometric and natural patterns, and intersecting circles unite to form multi-coloured leaves of bright colours, and schematic tree trunks with branches, in addition to diamond and rosette shapes comprise the interior decoration. These illustrations had been super-imposed over the originals because of the ban on icon painting in churches imposed by the Byzantine emperors of the Isausus dynasty (712-802A.D.) which, having commenced in Istanbul, spread throughout the entire Byzantine Empire eventually reaching our town. When the church was being repaired during the 14th century, after suffering damage from the earthquake of 1303 that rocked and almost destroyed Crete, it was discovered that the schematic decorations had concealed the Christian paintings. The church is now on the private land of the hotel Sensimar Minos Palace, but you do not need to traverse the hotel grounds. Whoever wants to visit the church may be represented at the nearby hotel reception to get the key (against a deposit of passport or similar). 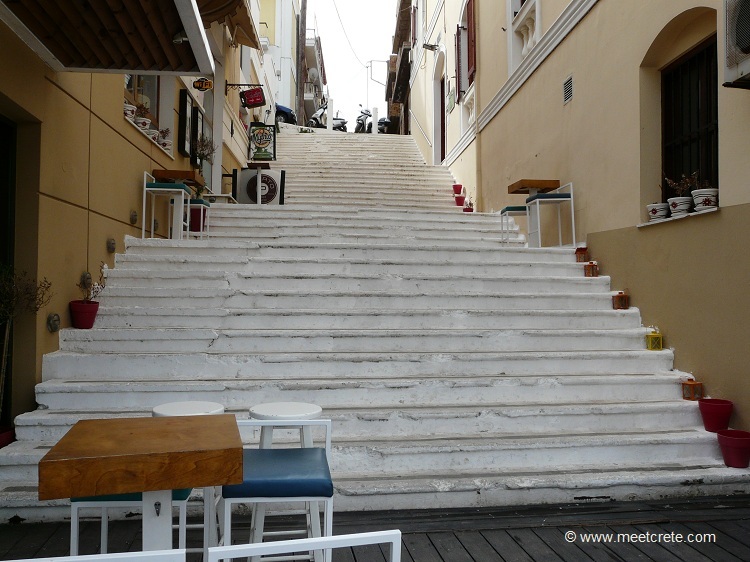 The church is not signposted; from the street right after the “Spilia” Bar go up the stairs. • Hiking through the canyon of Kritsa a) on the short walk (2 hours) or b) on the long road (4 hours). For more detailed information in the tourist information office (see above). 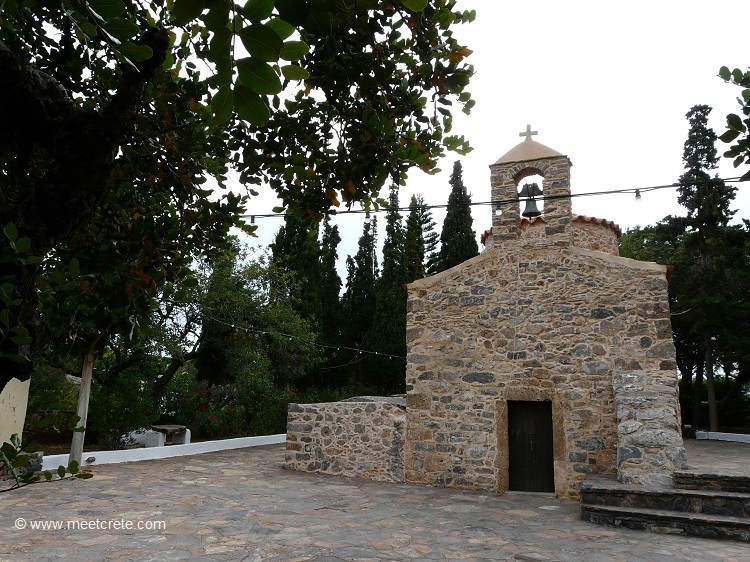 Tourist Information Office: Congratulations of the Municipality of Agios Nikolaos. The building of the tourist office is right next to the canal bridge and has excellent information in all languages and also very friendly staff. Step by and ask for the city and region folding map with a good city map and great information on attractions, hiking and biking trails, villages and monasteries etc. Opening times : in summer (01.04.-31.10.) from 08.00 – 22.00 hrs, in the winter months of November to March from 08.00 – 21.00 hrs. 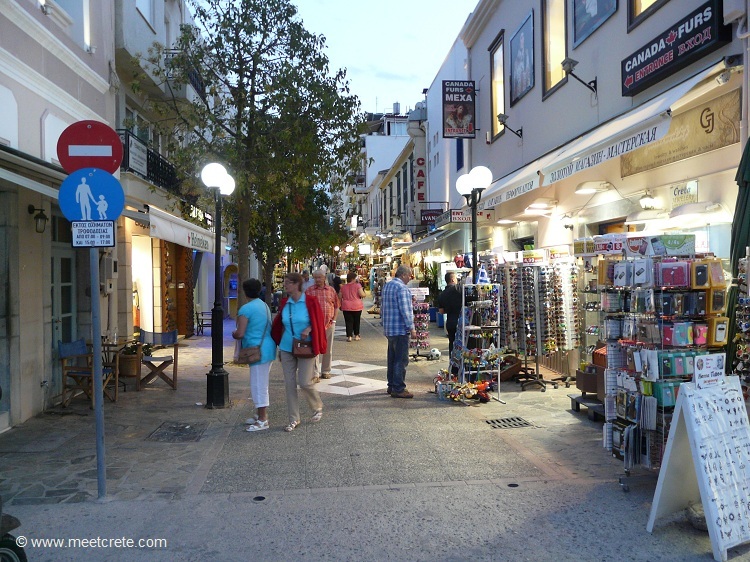 Parking: parking is a problem in the narrow streets of Agios Nikolaos. But the guarded parking is very inexpensive: 12 hours cost 3 euros.